Welcome back to the elegant art of feminine conflict. A year has passed since Reiko triumphed over the dark matriarch Madame Camellia and assumed the title of Grand Madame of the Tsubakikoji clan. Saori, the second daughter of the family, who Reiko defeated so ignominiously, can no longer contain her stress level, and at long last she vows revenge on the woman who humiliated her. 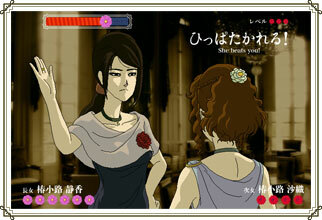 Can Saori defeat Reiko and reclaim the life of luxury and indulgence in which she grew up? 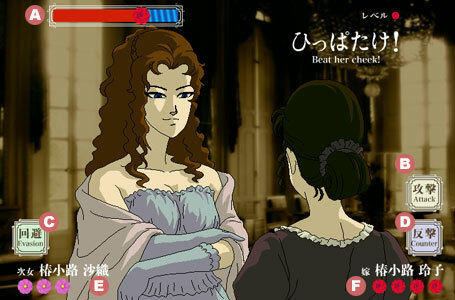 This is a minigame where you play as Saori, the second daughter of the Tsubakikoji family, and challenge Reiko, the reigning matriarch. You and your opponent try to slap each other until one side has lost all her health; the one left standing is the victor. Such is the genteel art of face-slapping, passed down from antiquity through generations of blueblood women. While it is a form of combat, it has its own strict ruleset and can be appreciated as a kind of magnificent sport. Since her defeat at the hands of Reiko, the protagonist of the first game, her extravagant lifestyle has been thoroughly disrupted. After a year of enduring disgrace, she begins to plot her revenge. An adult woman, she used to treat Reiko with contempt. However, since Reiko became the Grand Madame of the house, she has quietly acquiesced to Reiko’s authority. She has been the head of the housekeeping staff at the Tsubakikoji house for many years. As a member of the working class, she is not particularly affected by the change in matriarchs and has continued in her duties. Having defeated Camellia, the previous head of the clan, and claimed the madame’s dark powers for herself, Reiko’s power is unmatched. Her authority and physical strength are such that no one dares defy her.